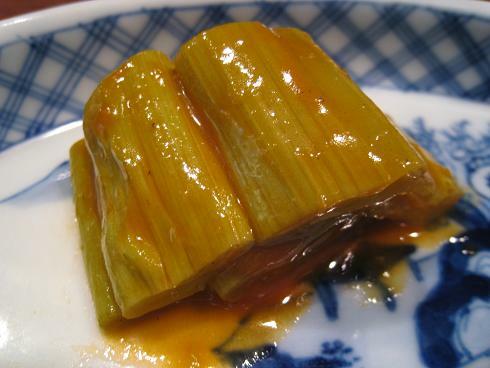 The Sansai/Mautain Vegetable season has started for good in Japan and might be around the corner in many parts of the world, but many people are still wondering how to prepare and eat them. Here is a simple explanation of how the Japanese do it with some of them. I’ll try to research for more in the near future. Japanese Knotweed (Fallopia japonica, syn. Polygonum cuspidatum, Reynoutria japonica) is a large, herbaceous perennial plant, native to eastern Asia in Japan, China and Korea. In North America and Europe the species is very successful and has been classified as invasive in several countries. About time to eat it, then! 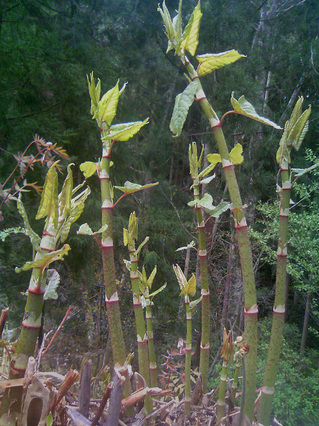 Other English names for Japanese knotweed include fleeceflower, Himalayan fleece vine, monkeyweed, Huzhang (Chinese: 虎杖; pinyin: Hǔzhàng), Hancock’s curse, elephant ears, pea shooters, donkey rhubarb (although it is not a rhubarb), sally rhubarb, Japanese bamboo, American bamboo, and Mexican bamboo (though it is not a bamboo). There are also regional names, and it is sometimes confused with sorrel. In Japanese, the name is itadori (虎杖, イタドリ). Japanese knotweed flowers are valued by some beekeepers as an important source of nectar for honeybees, at a time of year when little else is flowering. 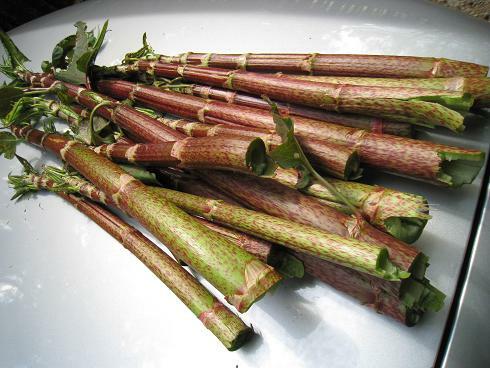 Japanese knotweed yields a monofloral honey, usually called bamboo honey by northeastern U.S. beekeepers, like a mild-flavored version of buckwheat honey (a related plant also in the Polygonaceae). The young stems are edible as a spring vegetable, with a flavor similar to mild rhubarb. In some locations, semi-cultivating Japanese knotweed for food has been used as a means of controlling knotweed populations that invade sensitive wetland areas and drive out the native vegetation. Peel the knotweed from the root (easier this way). Peel all the skin! Boil the knotweed. If you have a lot of them, proceed in batches. Once the knotweed colour has turned from deep green to “tea green”, the boiling should be enough. It would take up to 2 minutes for items of the thickness shown on the above picture. Note that that if the deep-green colour hasn’t sufficiently gone, the knotweed will be acid in taste. Now as soon as you attained the right colour, scoop knotweed out or over cooking will result in the plant breaking up. Very important! Transfer immediately into chilled water. Leave it there for a whole night and you will be able to get rid of astrigency and unwanted matters. Next morning drain, cleanse under cold running water and drain thoroughly. It can be preserved inside the fridge for quite some time inside a tupperware box. If you have a lot you can always make salty pickles of them. If you do so, just put them inside a tightly closed tupperware box with a good measure of salt. Wash them with plenty of water before consuming them. Freshly boiled, they can be eaten as they are with mayonnaise, or a simple dressing for vegans and vegetarians. A little chili pepper is fine, too! Two large knotweed (boiled and prepared as above). Gently simmer the whole together for a little while. Try and serve together with other boiled vegetables! Cut the aburaage into fine strips and fry them quickly with knotweeed. Add Mirin/sweet sake (1 tablespoon), men tsuyu or vegan dashi (a little less than a tablespoon) while frying. Finish with withsome sesame oil and eat at once! Great with beer or sake! 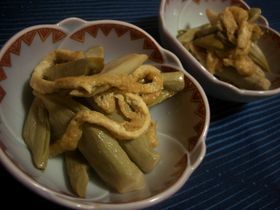 Itadori/Japanese knotweeed in tomato sauce!